I didn't add any new positions yesterday, and that may be the case again today until I can see what this market wants to do with overbought conditions (a rarity these days) and whether the market can consolidate some first. Volatility Index (VIX) - Not falling like it was last week. A small drop of 4.3% yesterday, taking it back down to 20.47. Seems overdue for a bounce here. T2108 (% of stocks trading above their 40-day moving average): A healthy move of 27% that took the indicator back up to 38%. Stocks are recovering, but the question is for how long? Moving averages (SPX): No major changes on this front yesterday. 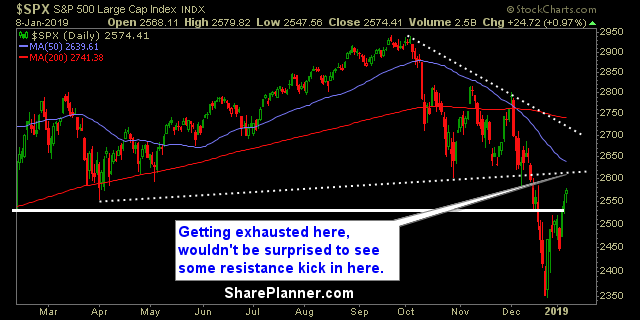 Still looking for a possible test of the 50-day moving average. Real Estate led the way, while surprisingly, Discretionary is now trading above its 50-day moving average. Some signs that traders are starting to get back into the "safer" sectors with Utilities being near the top. Overbought conditions are starting to emerge, and I am leery about adding new longs at this juncture. At some point, we'll start to see some profit taking, and a potential reverse back lower.